Wimberley City Hall is located at 221 Stillwater Road, Wimberley, TX 78676; phone: 512-847-0025. Photo: Winters-Wimberley House, ca. 1856, 14070 Ranch Road 12, Wimberley, TX. Built by William Winters and sold to Pleasant Wimberley ca. 1874. Listed on the National Register of Historic Places in 2002. Photographed by User:Renelibrary (own work), 2012, [cc-by-3.0 (creativecommons.org/licenses/by/3.0)], via Wikimedia Commons, accessed December, 2012. The City of Wimberley owes much of its charm to the forces of nature that gave geological form to the region now known as the Hill Country of Texas. Geologists seem to agree that this region was under water, indeed a seabed, at least two or more times. Even to the casual observer, the area's limestone underpinning with its numerous encased shells of sea creatures serves up proof of this ancient history. At the nearby San Marcos River, where the headwaters are fed directly from the Edwards aquifer, anthropologists have found evidence of some of the earliest settlements of the Northern Hemisphere, perhaps dating back as much as 12,000 years or more. It would seem that this area was hospitable even to our earliest forebears. In more recent times, the Hill Country was highly favored by various nomadic Indian tribes. Later still, Mexican and Texan cattlemen found the native grasslands and abundant water supply attractive for the raising of great herds of range cattle. Hays County was incorporated in 1848. Early settlers had already found that the cool clear waters of the San Marcos River provided a hospitable environment and the town now known as San Marcos soon began to thrive. Not long thereafter a little settlement appeared where the Blanco River and Cypress Creek meet. It was first known as Winters' Mill, after William Winters, who bought the mill from James Montgomery. Winters had volunteered at the Battle of San Jacinto, providing a colorful claim to Texas history for those who would follow to the Wimberley Valley. In 1864, at the death of William Winters, John M. Cude and his wife, Nancy Winters, inherited the mill and the settlement took the name Cude's Mill. 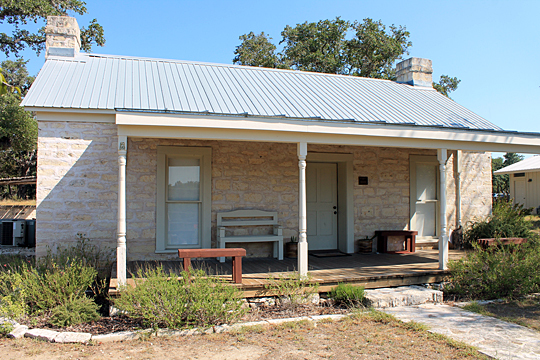 In 1874, Pleasant Wimberley bought the mill and the adjoining limestone residence for $8,000, paid in gold, and the settlement thereafter took the name Wimberley's Mill. The original request for a Post Office at Wimberley was sent to Washington, DC with the name Wimberleyville selected. The Postmaster General of the United States may have had a penchant for brevity, because he struck out the "ville" portion of the name and certified a new post office at a place called Wimberley. City of Wimberley, Comprehensive Plan, July, 2008, www.cityofwimberley.com, accessed December, 2012.